This vehicle has 2 (or 3) fuse panels, one located in the driver’s side panel bolster, the other in the engine compartment near the battery. If any of your vehicle’s lights, accessories, or controls do not work, check the appropriate circuit fuse. If a fuse has blown, the element inside the fuse will be melted or broken. If the electrical system does not work, first check the driver’s side fuse panel. Before replacing a blown fuse, disconnect the negative battery cable. Always replace a blown fuse with one of the same rating. If the replacement fuse blows, this indicates an electrical problem. Avoid using the system involved and immediately consult an authorized HYUNDAI dealer. 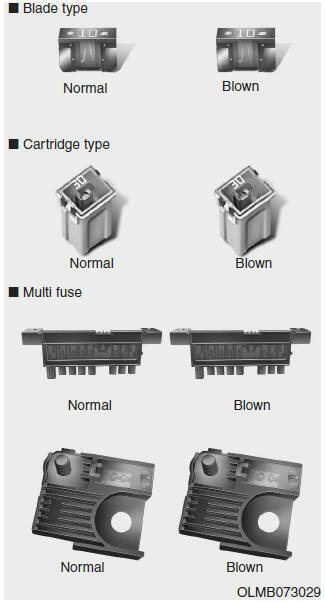 Three kinds of fuses are used: blade type for lower amperage rating, cartridge type, and fusible link for higher amperage ratings. Do not install a wire or aluminum foil instead of the proper fuse - even as a temporary repair. It may cause extensive wiring damage and possibly a fire.